The British Gazette » Operation Chastise 2: Our best chance of Brexit? 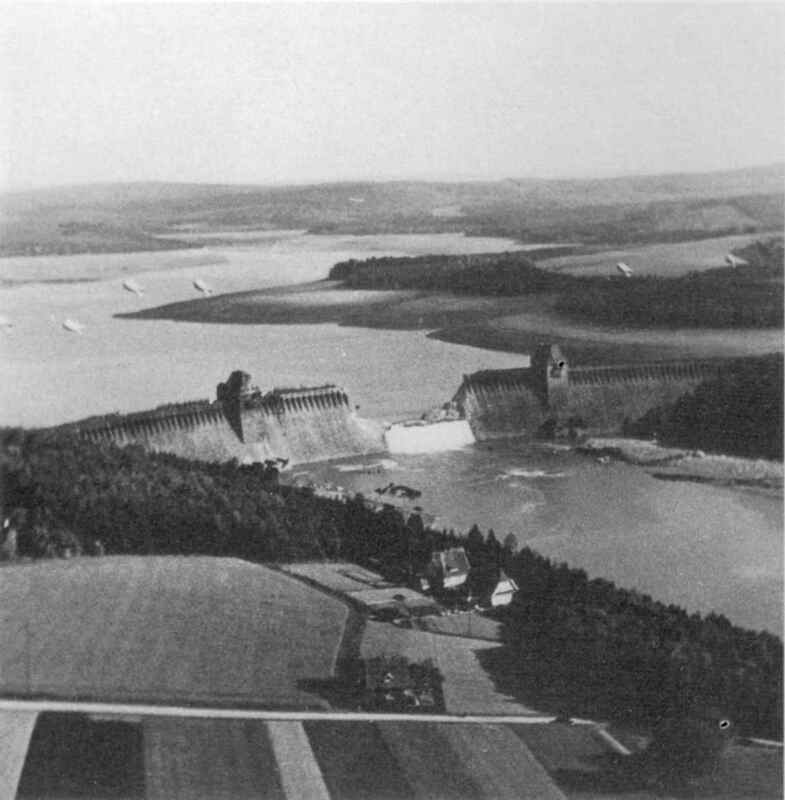 Above, the Möhne dam the day following the Dambusters raid. Operation Chastise was an attack on German dams carried out on 16th – 17th May 1943 by Royal Air Force No. 617 Squadron, subsequently known as the “Dam Busters” led by Wing Commander Guy Penrose Gibson VC, DSO & Bar, DFC & Bar. Of the 19 aircraft dispatched, 8 were lost. Of the 133 air crews, 53 men were killed in action and 3 survived to become prisoners-of-war. The details of the 34 air crew decorations: Victoria Cross – 1; Distinguished Service Order – 5; Distinguished Flying Cross – 10; Bar to Distinguished Flying Cross – 4; Conspicuous Gallantry Medal – 2; Distinguished Flying Medal 11; Bar to Distinguished Flying Medal – 1. By applying the moniker Operation Chastise 2 to the furore surrounding the Sun’s allegations about when, where and what the Queen said or did not say the British Gazette does not seek to equate in any way the conduct of the Sun’s journalists to the courage and determination shown by those very brave men of Bomber Command. However what the British Gazette does do is to make comparison with the consequences. What is fairly certain is that the fallout from this furore (http://www.bbc.co.uk/news/uk-politics-eu-referendum-35770909?SThis914.4FB) will prove to be disastrous. The uncertainty is this: For whom? For such as the unfortunate Dominic Cummings the unthinking assumption with be: Advantage Brexit! That is not necessarily the case! It all depends on A: what happened and B: How do we (the Brexiteers) handle it. - Mr Tony Gallagher, The Sun’s editor-in-chief is not a fool and would not have gone to print on anything less than solid facts. “We knew much more than we published,” he said in an interview. - Mr Clegg has come out and made a complete and emphatic denial. - The Queen’s remarks are reported to have been made at a Privy Council meeting. Before we continue in our considerations we have to remind ourselves of some FACTS – unpleasant though this might be for such as the unfortunate Cummings! FACT 1: Privy Council meetings are held in secret. FACT 2: Privy Councillors take an oath in which they promise to keep such meetings secret. They also make a promise to ensure that no Foreign Prince, Potentate or Power shall have precedence in the land! This seems to have escaped the notice of Mr Clegg! FACT 3: Privy Council meetings are an occasion where monarchs can – and it can be argued have a right – to speak their mind. This is one reason why the meetings are secret! If a monarch wishes to express an opinion on a matter which can be regarded as “political” Privy Council meetings along with meetings they have with their Prime Minister are an opportunity to do so. Now, it is known that the Queen likes on many occasions to get these meetings over and done with in a short and perfunctory manner – she takes the view that since she is a constitutional monarch and the government of the United Kingdom of Great Britain and Northern Ireland is the day to day responsibility of her ministers, there is normally no requirement for her to “get involved” in any political discussion. The meetings are therefore kept short. It is also known that she insists on holding many meetings standing. That she does this to ensure that the mostly male politicians do not drag the meetings out with discussion. Clearly then, any such expression of an opinion by the Queen at such meetings will come as a great surprise to those who are accustomed to such meetings being brief and perfunctory affairs. - It now depends on how the various parties handle this. In making it’s complaint, will Buckingham Palace dispute the content of The Sun’s report or will it confine itself to a complaint that Privy Council meetings must not be reported and that the monarch has been, is and will continue to be above/outside politics. - the question of “who leaked this” is very important. If it is a certain Mr Gove, then the whole furore could backfire disastrously on the Brexiteers! A strategy based on arguing that the UK is better off out and worse off in CANNOT SUCCEED! If the Brexiteers pursue this strategy – even with the excellent Doctor North’s Flexcit proposal – which is the only “doable” exit strategy – THEY WILL LOOSE! You see, Flexcit, whilst demonstrating there is a practical, cost free, risk free path out of the European Union that will benefit the UK, can do NOTHING about the Free Movement of People as this – until Turkey joins the EU – is part of the Single Market. This is why the Brexiteers cannot win with their existing strategy as they cannot answer the Remainers question: “What is your plan B?” in any detail! The Brexiteers problem is this: British Voters like Jam Today. They are prepared to wait for Jam Tomorrow and can sometimes be persuaded to wait for anything up to a year for their jam. They will however never be persuaded to wait a decade! This is how long it will take for the UK to move away from the single market and have the freedom to control its own borders. So on the “hot button” issue of immigration, the Brexiteers cannot deliver! Rest uneasy! Such as Lord Mandleson know this! We therefore need another strategy. Now! Before we proceed any further we wish to play a mind game with you Dear Reader. We want you to place yourself in a totally hypothetical situation. You are on holiday in the high Andes in South America. You are kidnapped by a group of terrorists. One of the gang tells you that the “other side” are not meeting the group’s demands and that they are going to kill you in the morning. This gang member has had a change of heart and proposes that he and you will escape. The problem is that escape means crossing a ravine. This can only be done one way in a triple rope crossing. This is a crossing comprised of three ropes suspended across the ravine (which is 3,000 feet deep [914.4 metres, Derek] in the centre) it is like walking a tightrope but holding on to two other ropes. There is a strong wind blowing and the chances of slipping are very high and with that certain death if you loose your grip of ropes that will be cold, wet and slippery. In other words, you have an invidious choice. You can make your escape attempt which has a high risk of death or stay where you are and face certain death by a bullet in the head in the morning. There are two areas where we know the Remainers are vulnerable. There is a strategy taught in military academies across the world: Attack your enemy at their weakest point! - We know where are enemy’s weakest point is! The constitution and sovereignty! - We know that this and past governments have and continue to break their Privy Council Oaths in which they promise to keep such meetings secret. They also make a promise to ensure that no Foreign Prince, Potentate or Power shall have precedence in the land! - We know that the Queen has by their actions and of the UK’s membership of the EU been placed in breach of Her Coronation Oath to govern us according to OUR laws and customs and NOT those of the EU! - We know that the Chameleon has lied and continues to lie about the legally binding nature of the supposed deal he has received from Frau Doktor Merkel! Our ONLY chance of success on 23rd June 2016 is to use the present furore to ensure that the British voters know what has and what continues to go on: unconstitutional and unlawful government by a group of lying traitors. You see, the immediate outfall of such a strategy would – in the run up to the vote – for it will be loo late afterwards! – result in the discovery of just WHY past and present British governments have placed themselves in this position! The reason lies of course not in Europe but across the North Atlantic in Washington DC! As most British Gazette readers know, the USA wants the UK within the EU as the UK’s presence slows down and inhibits the process of European integration. The State Department of the USA has pursued the same strategy for decades now whether or not a Democrat or a Republican occupies the White House. The USA wants to see a strong cohesive EU – insofar as economic and trade issues is concerned. It does not however want to see the EU exercise geopolitical and military power reflecting it’s size. Keeping the UK in the EU and also having the EU expand to take in such as Turkey (again a policy enthusiastically endorsed by the State Dept.) ensures that this continues to be the case. Be under no doubt as the the consequences of Brexit! The EU would rapidly move towards much closer integration! This would seriously [expletive deleted] Washington DC! The UK can expect a negative outfall post Brexit! The Security Council will not admit more members as that would involve making a new place and the two most deserving candidates India and Japan would face objections from Pakistan and every other Sunni Muslim UN member state in the case of India and Japan would face a Chinese veto. Loss of PM status for the UK would result in Argentina petitioning the Security Council for substantive discussions on the sovereignty of the Falkland Islands. A post Brexit UK government would find itself forced into a deal over the Falkland Islands it wanted assistance and co-operation from other countries in re-establishing its presence on the World Trading Organisation. Then we have the question of Scotland: You see, if we want to keep Scotland as part of the UK we have to discredit utterly the Remainers case! We can only do this using the constitutional argument! Of course, another thing we can be fairly confident about is that whilst the possibility exists – dependent upon pursuing the above mentioned strategy – of a Brexit victory in England and also Wales, it is unlikely to be so in Scotland and Northern Ireland. Here however is the kicker: the one part of the UK that is guaranteed to do best outside the EU is Scotland! That is because of Scotland’s fishing waters and small population! This of course is the idiocy at the heart of the SNP’s Europhillia! What the SNP should have argues for in the Independence referendum is true and full independence. Leave the UK and the EU. Re-establish Scotland’s fishing grounds to the 200 nautical mile limit and establish a trade deal by pursuing the Norway Option! Of the nationalists only the sensible Mr Jim Sillars argued for this!